Kettlewell Camping is situated very much on the way to and from other places – it’s a mere 10 metres from the famous ‘Dales Way’ and 14 miles from the busy market town of Skipton. It would be tempting to think of this site as just a convenient stopover, that is, until you see the views. The flower-rich hay meadows and deep woodlands of the Upper Wharfe Valley surround you, creating a wonderful backdrop and the ideal location to go and explore the great outdoors. The lovely village of Kettlewell itself – a perfect miniature of what a Yorkshire Dales village should be – is only a short walk away, and completes a very agreeable camping picture. Previously run from Fold Farm, Kettlewell Camping has a new, easier access point from Conistone Road. 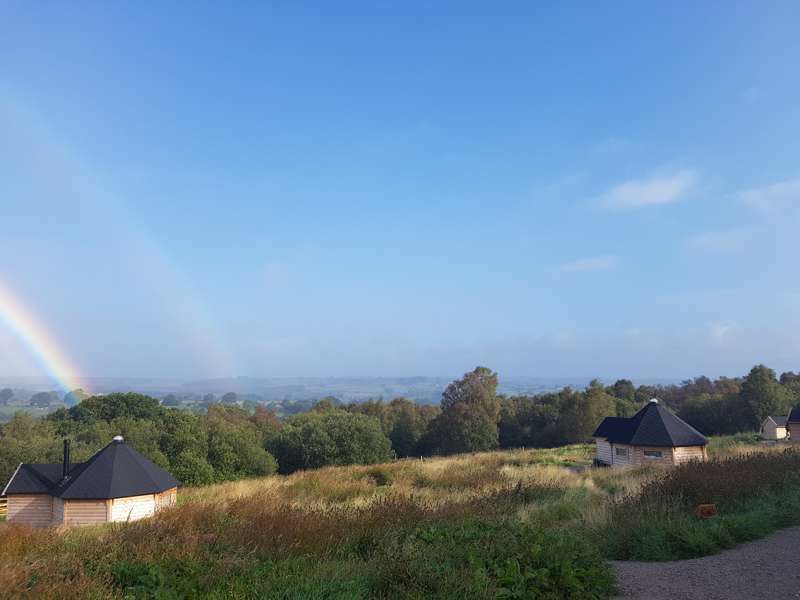 But that's not the only change - the owners have worked closely with the National Park Authority to produce a new facilities block for 2015 (hot showers and under-floor heating), which is thoughtfully in keeping with the site's natural surroundings, making only a small carbon footprint. The site itself is a wonderfully simple, with just one field and room for around 40 tents. The field is a little undulating in places, but most campers seem to find a flat section of land. If you fancy the convenience of travelling light, or feel its time for a splurge of hassle-free glamping, then why not treat yourself to one of Kettlewell's furnished bell tents? Each pre-erected tent sleeps four comfortably and comes kitted-out with its own stove to facilitate that all-important morning cup of Yorkshire tea (other brands are available!) There can't be many better ways to start the day as you un-zip your toasty tent and lock eyes upon the surrounding patchwork of greens and browns. Four-legged friends aren’t allowed here, but us lucky humans can enjoy the raised fire-pit and long evenings in the fresh Yorkshire air, whatever the weather. With its camping field only the throw of a tent peg from one of England’s most idyllic walks, Kettlewell Camping is certainly a site that owes a lot to its enviable location. But that shouldn’t detract from the place itself. 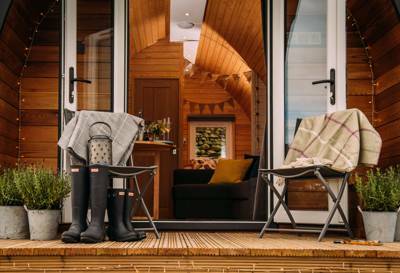 This family-run campsite (of three generations) has a welcoming atmosphere, facilities have been improved and the site's impressive eco-credentials even stretch to the hot showers, where hot water is produced with a near carbon neutral wood pellet boiler. So the package is complete; a relaxing space to pitch the tent and a wealth of walks quite literally on your doorstep. I’m sitting at Kettlewell right now and all I can see are wonderful views. All I can hear however are screaming children ( so far I have had 3 footballs come in my tent) and the breathing of the people next to me as they are pitched that close Couldn’t be more disappointed. This site seems to operate the policy of packing in as many tents as possible. With open fire pits on the go, at least 20 kids careering about some on bikes I am worried about safety. Will make sure I am out til late tomorrow to avoid this cacophony. If you are looking for peace and quiet avoid at all costs. We stayed here early August for 4 nights and loved it. The location is perfect in such a lovely village with great pubs and walks near by and we were lucky enough to be there for the scarecrow festival which was great fun! The site is small but not too crowded and has beautiful views. The toilets and showers are the best at any campsite we have ever been to, clean, warm and have everything you could need e.g plugs, large mirror, underfloor heating! The owner was laid back, helpful and friendly giving the campsite a nice friendly, welcoming touch. We only have positive things to say about Kettlewell Camping and will recommend to friends and family! I visited this campsite in early July and thought it was lovely. Only very small but the facilities are all brand spanking new and very well looked after. The village itself is nice – especially the pub – and easy access to the footpaths from the campsite. Fab little find. Can't recommend enough! Stopped here recently as part of group walking the Dales Way. The welcome we received was very warm and the quality of the showers and facilities unexpected considering we were expecting to rough it on our four day expedition. Showers included in cost of camping as is use of fridges etc. Very friendly, great location, great views. Ideal for back packer but will also consider returning for family camping. Villages and pubs a 2 minute walk away. Just returned from a very wet couple of days on this site over the early May Bank holiday. Excellent campsite. Friendly, well kept with one of the best toilet blocks I've seen. The underfloor heating was especially welcome. Well placed for all the facilities in the village including three pubs and two cafes We ate at the Bluebell Inn - great beer and great food and a really friendly welcome from the landlord and bar staff. We'll definitely be going back again, hopefully when the weather is better. We had two great days here. It's a lovely simple site close to a picturesque village with two really nice pubs(and a third one) for when you don't want to eat outdoors, and the new toilet facilities are probably the best I've experienced. On our second evening we came back to our tent after a day out to discover one of our poles had snapped. I asked at Reception whether they might have some gaffer tape. Not only did the manager (Nigel?) have a spare set of poles, he also helped me fit it, which is way more than he needed to but probably spared us having to leave early. Tents, campervans (no larger than a classic VW) and dogs - yes. Motorhomes, caravans and unattended young groups – no. Located in the southern edge of the Yorkshire Dales, the ancient town of Skipton is renowned for its outdoor market which can trace its routes back to the middle ages. The market is held every Monday, Wednesday, Friday and Saturday with over 50 independent traders setting up their stalls on both sides of the high street leading up to the gates of its historic medieval castle. The market is well known for the quality and wide range of goods on offer. High on Ilkley Moor, the Cow and Calf Rocks are a large rock formation consisting of an outcrop and boulder. The rocks are made of millstone grit and are so named because one is large, with the smaller one sitting close to it, like a cow and calf. Back down the mountain, Ilkley Pool and Lido (01943 600453) is one of Britain's last remaining public outdoor swimming pools. Open during the summer months only, the lido remains a popular place to swim or somewhere to enjoy the sunshine. There is also a heated indoor pool (open through the year). The Kings Head (01756 761600) is a lovely local serving filling dishes such as ham hock terrine, salmon en croute and sticky toffee pudding, in front of a huge massive inglenook fireplace. Recently taken over by Michael and Jenny, this pub/hotel was ranked by The Sunday Times in the top 10 pubs in The Ultimate 100 British Hotels. If you are looking for a full English breakfast, Bettys Tea Room in Ilkley (01943 608029) is a good choice. Alternatively, you can stock up on a cake or two from the shop before setting out for a lengthy hike. Refurbished in 2012, The Wells Cafe (01943 601793) is a family restaurant with relaxed atmosphere. All dishes are freshly made on the premises and the menu changes weekly to ensure the best use of seasonal produce. Kettlewells Camping's 'find us' page on the website gives comprehensive directions from any address. The bus route and times are also detailed.